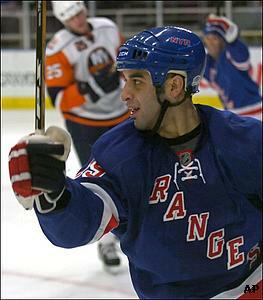 The Rangers' Scott Gomez celebrates his second-period goal against the New York Islanders. The one thing the New York Rangers haven’t been able to do in an otherwise-successful start is beat their suburban rivals, the Islanders. Despite a host of big-name talent, the Rangers lost their first three meetings with the Isles, all by one goal. Their frustration was building, until Thursday night, when the Rangers finally solved Islanders goaltender Rick DiPietro. Chris Drury had a goal and assist on two second-period power-play goals as the Rangers beat the Islanders 4-2 at Madison Square Garden. The Rangers had scored only four goals in the three losses and were 3-8-1 in the past 12 matchups with the Islanders, dating to April 11, 2006. DiPietro played in all but one of those games and allowed two goals or fewer eight times. DiPietro, starting for the 18th straight game, wasn’t quite as sharp as he had been in the first three meetings. Nor were the Islanders, who made numerous turnovers and showed the effects of a hard-fought 3-2 shootout win over Ottawa on Wednesday. Jaromir Jagr scored the only goal of the first period ( 700K ) to give the Rangers the lead, but the Islanders tied it when Miroslav Satan was credited with a power-play goal early in the second period ( 700K ) when Rangers defenseman Michal Rozsival appeared to tap the puck into his own net. The way Roberto Luongo is playing these days, no one may ever score on him again. Luongo set a team record with his third straight shutout, stopping 26 shots on Thursday night as the Vancouver Canucks blanked the Columbus Blue Jackets 2-0. The Islanders failed to score in the first period for the seventh time in their last eight games. The loss ended the Islanders’ 5-0-1 unbeaten streak at Madison Square Garden. The Rangers finished the month of November with a 10-3-1 record; two of the losses were to the Islanders. "We really needed the points and needed to jump up in the standings, and obviously they've had our number the past few games." -- New York Rangers forward Brandon Dubinsky. But then the Islanders got into penalty trouble — and the Rangers made them pay. Drury scored at 6:20 after DiPietro gave up a bad rebound on Dan Girardi’s shot ( 700K ). Exactly 10 minutes later, Scott Gomez took a slick behind-the-back feed from Drury and put the puck high into the net with DiPietro on the ice ( 700K ). It was the first time in nine games that the Rangers scored twice on the power play, and the first time that Drury and Gomez — New York's prized free-agent acquisitions this summer —scored goals in the same game. Mike Comrie’s goal at 17:57 of the second period ( 700K ) cut the margin to 3-2, but after Henrik Lundqvist held off the Islanders for most of the third period, Brandon Dubinsky’s redirection of Martin Straka’s pass with 3:16 left in regulation ( 700K ) sealed the win. "We really needed the points and needed to jump up in the standings, and obviously they've had our number the past few games," Dubinsky said. The victory was a welcome one for the Rangers, who don’t see the Islanders again until March and didn’t want go down 0-4 against their biggest rival. "It was a big game for us," said Lundqvist, who finished with 22 saves. "We don't want to go oh-and-four against these guys. They're a division team, a New York team. It was a big step for us." It was the 11th straight game in which the Islanders have scored two or fewer goals in regulation. They are 5-5-1 in those games, mostly thanks to hard work and DiPietro’s excellence in goal. But the lack of scoring appears to be getting a little wearing on the Isles. The Isles’ biggest problems are coming on the power play. Satan’s goal broke a 1-for-25 drought that including four failures in the first quarter. ''The biggest thing was our power play. It's failed us for way too long,'' Islanders captain Bill Guerin said. ''Things have to change. It's got to get better.